You can even get your Combo Membership Online! Please click the "Donate" button to contribute to the PTO. Any donation is welcome! Please enter $105 for your donation amount if you would like to purchase a Combo Membership that includes: PTO Donation ($25), GO Discount Card ($20), Family Pack for Morley Picnic on June 7, 2019 ($40), and a Yearbook with a message ($20). Thank you! If you would like to buy a GO card only, please fill out the form here. WHAT IS IT? 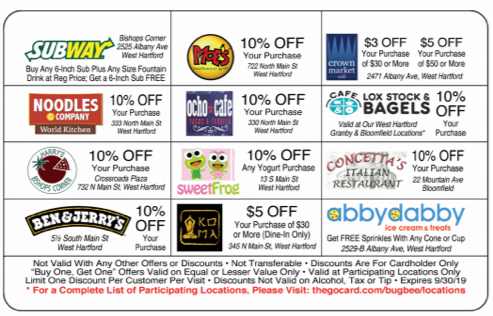 The Morley GoCard is a discount card that gets you special money-saving offers from twelve West Hartford businesses for one whole year – you can use the card again & again, all year long! The cost of the card is donated to the Morley PTO!!! HOW DOES IT WORK? Just show your GoCard at any of the businesses listed on the back of the card and receive your discount! It is good until September 30, 2019, and can be used repeatedly throughout the year. Keep it in your wallet (it’s the size of a credit card) and use it every time you go to one of the listed businesses! WHO CAN USE THE CARD? Anyone! Buy one or two for your family, buy some for family or friends or neighbors, or give cards as gifts – the GoCard is a great money-saver for everyone, not just Morley families! Volunteer at Morley's own super fresh salad bar most Wednesdays. Morley's own salad bar is run solely by volunteers like you! Morley is great because of our volunteers! Please consider getting involved. Click here for form. If you shop on Amazon.com, this deal is for you, and Morley's PTO! AmazonSmile is a website operated by Amazon that lets customers enjoy the same wide selection of products, low prices, and convenient shopping features as on Amazon.com. The difference is that when customers shop on AmazonSmile (smile.amazon.com), the AmazonSmile Foundation will donate 0.5% of the price of eligible purchases to Morley's PTO! Please click here for Morley Reader issues.